Lasers and light sources use the principle of selective photothermolysis to eliminate hair and its potential regrowth without damaging the surrounding skin. 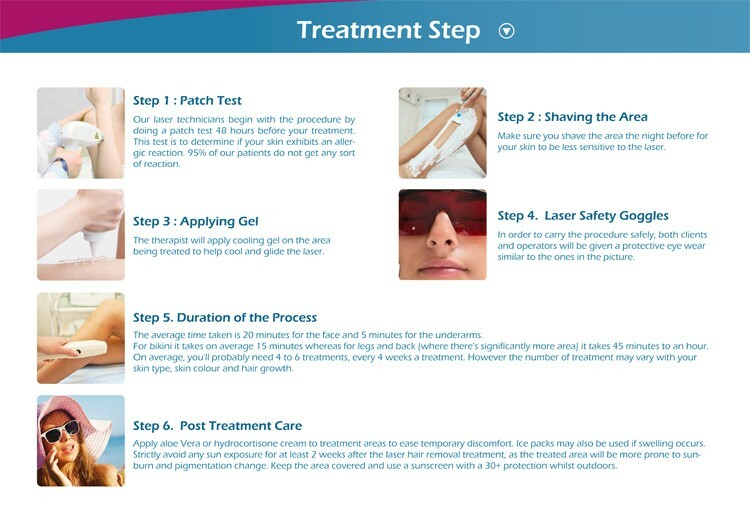 During a laser hair removal treatment, light passes through the skin and is absorbed by the melanin in the hair shaft. This absorption raises the temperature of the hair follicle and thermally destroys the cells responsible for regrowth. The attributes of the light (wavelength, pulse duration and power) are chosen to ensure damage to these cells and not to the rest of the skin. In keeping with our mission to offer the high quality machines .Diode laser Series all use the 10 german laser bars . Max prolong the stable using lifetime and optimized energy fluence compatible with 2.4cm² big spot. performance , keep the machine continues long times work .